WestJet (Calgary) has announced it will resume its nonstop seasonal service between Toronto (Pearson) and Myrtle Beach, South Carolina, on March 6, 2014, nearly two months earlier than in 2013. The twice-weekly service will operate on Thursdays and Sundays from March 6 to October 23, 2014, with a change in flight times effective April 27. Thursday 1154 Toronto at 6:45 p.m. Myrtle Beach at 8:50 p.m.
Thursday 1155 Myrtle Beach at 9:35 p.m. Toronto at 11:30 p.m.
Sunday 1154 Toronto at 3:15 p.m. Myrtle Beach at 5:20 p.m.
Sunday 1155 Myrtle Beach at 6:10 p.m. Toronto at 8:05 p.m.
Thursday 1154 Toronto at 9:35 a.m. Myrtle Beach at 11:38 a.m.
Thursday 1155 Myrtle Beach at 12:25 p.m. Toronto at 2:27 p.m.
Sunday 1154 Toronto at 9:35 p.m. Myrtle Beach at 11:38 p.m.
Sunday 1155 Myrtle Beach at 12:25 p.m. Toronto at 2:27 p.m. Copyright Photo: James Helbock/AirlinersGallery.com. 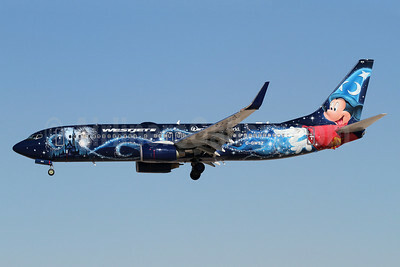 Sparkling in the California sun, Boeing 737-8CT C-GWSZ (msn 37092) in the new “Walt Disney World” scheme arrives in San Diego. The flashy logo jet is known as the “Magic Plane”. Click on the photo for the full size view. This entry was posted in WestJet and tagged 37092, 737, 737-800, 737-8CT, Boeing, Boeing 737, Boeing 737-800, C-GWSZ, Myrtle Beach, SAN, San Diego, Toronto, WestJet, WestJet Airlines on January 7, 2014 by Bruce Drum.